Karlsruhe, Germany, October 13, 2015 – EIZO GmbH is expanding its product portfolio by introducing its newly developed software called CuratOR Caliop. 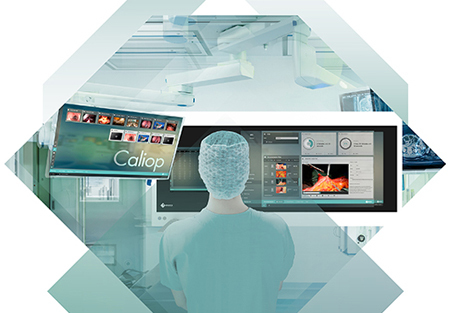 CuratOR Caliop enables image and video management systems to be controlled centrally with the option of integrating all important patient data. In a modern OR a variety of different devices and equipment with different user interfaces are used. In addition, workflows require precise planning, error-free and fast usability, and seamless interplay between all components. EIZO's CuratOR Caliop software is developed specifically to meet these requirements. It considerably lightens the workload of the OR team which can then better concentrate on the patients and their treatment. The Caliop vm Element is a video management system that allows the user to select connected video signals easily and intuitively and switch to different output devices. Output devices can be monitors, streaming encoders, or recording hardware. Furthermore, EIZO video technology enables multiple signals to be displayed on one 8 megapixel monitor in different layouts. The Caliop doc Element facilitates the documentation (photos and snapshots in HD quality) of all video signals networked with CuratOR Caliop. This makes video materials available for documents, insurance providers, and training purposes. In addition, Caliop doc also allows the image content displayed on the EIZO 8 megapixel screen to be recorded, handling up to 8 signals simultaneously. Regardless of the installed Element, CuratOR Caliop comes with features like dashboard, stopwatch, and countdown. Moreover, with an additional service called Caliop Connection, EIZO offers the option of connecting the software to the hospital's IT infrastructure, which allows Caliop doc to be used considerably more effectively. Connection creates the links to patients' electronic health records (EHR) from HIS/RIS or PACS. Non-medical archives can also be linked. The connection is established via DICOM. By connecting via Caliop Connection, users can retrieve patient files directly through Caliop doc and link recorded videos and snapshots to patient information. CuratOR Caliop software is installed on the integrated computer of a CuratOR Surgical Panel. This creates a workstation that is unrivaled when it comes to ergonomics and user friendliness. The user interface is impressive with its appealing and modern design, and the intuitive user navigation with a shorter learning curve that makes routine steps easier. Additional Elements and expansions for CuratOR Caliop are under development. The delivery date for CuratOR Caliop is scheduled for the end of the year. Local availability may vary, so please contact the EIZO subsidiary or distributor in your country for more details. Visitors to the Medica 2015 trade show in Düsseldorf, Germany, can see the new product for the first time at the EIZO booth, Hall 10, #H41. EIZO GmbH is based in Karlsruhe, Germany and is a leading manufacturer of visual display solutions for medical imaging applications. The branch office of EIZO GmbH in Plauen, Germany is solely dedicated to the development, production, and sales of OR solutions. The company’s portfolio includes color and gray-scale monitors from 1 to 8 megapixels, image management systems, and accessories as well as individual products and complete solutions for the OR. EIZO GmbH is a subsidiary of EIZO Corporation, a global leader in the manufacture of high-end visual display solutions for medical and graphic applications, air traffic control, and other markets.